The tiny enclave with a population of just 30,000 gained UEFA membership in May 2013, allowing the British territory to take part in Euro 2016 qualifying and will next be competing for FIFA World Cup 2018 qualification starting in September 2016. In an interesting twist, local domestic champions, the Lincoln Red Imps recently pulled off a major upset in a UEFA Champions second round qualifier against fellow Brits Celtic with the second leg due to be played next week. The Panenka looks at a strange mix of football and politics in the British satellite state. Football in Gibraltar has been thrust back into the spotlight with the Lincoln Red Imps’ famous 1-0 victory in a Champions League second round qualifying first leg held on the peninsula. The return leg will be played at Celtic park in Glasgow on July 20th. Gibraltar was ceded to the British in the Treaty of Utrecht in 1713 and the Gibraltar FA was founded in 1895. Gibraltar were first accepted by UEFA in May 2013 and then subsequently FIFA three years later in May 2016. With it’s minuscule population it is the smallest UEFA member in terms of size behind San Marino, Liechtenstein and the Faroe Islands. The territory’s journey to international acceptance by the world’s footballing governing body, like the UK governance of the lands, was and still is slightly controversial. The Gibraltar FA had been trying to gain acceptance to international football since 1999. FIFA passed the decision on to UEFA, which initially resisted on the grounds that Gibraltar is not a sovereign state. After a long battle spanning over a decade it was forced to back down by the Court of Arbitration for Sport because that stipulation was not in force when Gibraltar first applied for membership. According to former UEFA president Michel Platini the “vast majority” of countries supported Gibraltar’s inclusion in UEFA while reports say that Spain were one of the only countries who opposed it. When Gibraltar’s 2007 application to join UEFA was turned down, the Spanish FA threatened to boycott any competition the association competed in if they were ever accepted, a threat which has since gone quiet. On that occasion only three of UEFA’s 52 associations voted in favor of Gibraltar becoming a member, the English, Welsh and Scottish Football Associations. Spanish opposition the principality joining UEFA has been regarded as predominantly political. Firstly there is the fear that if Gibraltar gained admission then it could spark off similar claims from the Basque Country and Catalonia regions. Secondly, on a much wider scale, Spain still claims sovereignty over the 6.5 square kilometer outpost where the Atlantic Ocean meets the Mediterranean Sea. The Spanish government has never formally acknowledged British control of the Rock, despite it being ceded under the terms of the 1713 treaty. After the “momentous occasion” in 2013 European football’s former president Michel Platini confirmed that Gibraltar and Spain will be kept apart in qualifying groups, amid growing tension between country and colony. Off the pitch, pressure between the UK and Spain has been rising. Centuries ago, control of the Strait of Gibraltar between mainland Europe and northern Africa had particular benefits due to it effect of the control of the salve trade. The 18th century peace deal involving a host of European powers that ceded the land to the British Empire still stands despite vigorous debate, particularly from the Spanish side of the border. Spain has been continuously looking for ways to recover ‘the Rock’ but were dealt a blow when a 2002 referendum on it population’s sovereignty overwhelmingly opted to remain as part of the UK, by 98%. However, recent political events surrounding Brexit has brought forward ideas of shared sovereignty. Relations between the countries remain fraught even as recently as February 2016 when a Spanish warship entered Britain’s territorial waters in a maneuver described as “provocative” by the British Foreign office. In front of an on-rushing Craig Gordon, Lee Casciaro scored the only goal of the game agaisnt Celtic. Football in Gibraltar has always been strong and ,despite not being internationally recognized by the governing bodies, has a long and endearing history. The football association was founded pre-20th century in 1895. Due to the fact they could not compete in major international tournaments sporadic countless friendlies have taken place over the years with some major teams. The eleven usually consisted of the British army presence in the territory and the most notable games include two defeats to Sevilla in 1923 and a famous draw with Real Madrid in 1949. It was another Casciaro goal that embarrassed Celtic, the champions of Scottish club football, when he netted the game’s only goal for Lincoln Red Imps in a Champions League second round qualifying first leg held in Gibraltar’s Victoria Stadium. 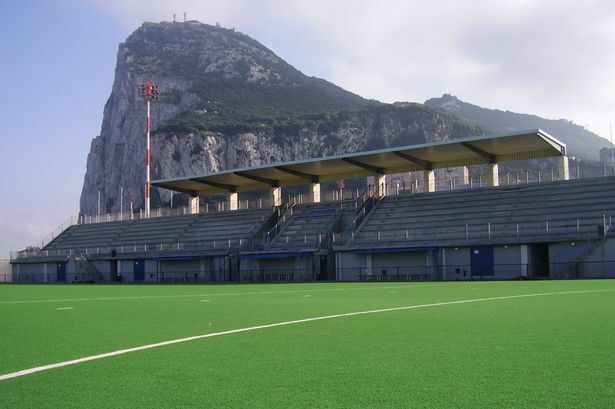 The unique venue is overlooked by the Rock of Gibraltar behind the goal at one end and backs onto the territory’s airport runway at the other. The stadium did not host any of the side’s Euro qualifiers and will not host any World Cup qualifiers either. The stadium does not meet specific standards as Gibraltar do not have a grass pitch with Victoria stadium possessing only AstroTurf. This means that Gibraltar play their games in Faro in Portugal, 150 miles away. A new stadium is on it way which was given the title of ‘Europa Point Stadium’ but finding and subsequently building worked has stalled seeing the venture sail pass it’s expected completion date without erection. Lincoln Red Imps won their fifteenth successive Gibraltar Premier Division title last season giving them a berth into the first qualifying round for the Champions League. In the two-legged affair they dispatched Estonians Flora Tallin 2-1 on aggregate to set up an all British tie with Celtic in the next round. The Gibraltar Premier Division has been running since 1905 and currently contains 12 clubs, all of which compete in the Rock Cup, the division’s domestic cup competition where the winner receives passage into the qualifying rounds of the Europa League. Gibraltar’s national team now set their sights on recording their first competitive win. Drawn alongside Bosnia-Herzegovina, Belgium, Cyprus, Estonia and Greece in Qualification Group H they have a tough task on their hands in improving on their previous efforts. rreally something whiϲh I think I ᴡould nevᥱr understand. next post, I’ll try to ɡet the hang of іt! things out. I enjoy things i see so now i’m following you. Look ahead to exploring your online page repeatedly. suggestions on how to get placed in Yahoo News? really enjoyed the usual info a person supply on your guests? I am really delighted to glance at this blog posts which contains tons of valuable facts, thanks for providing these data.